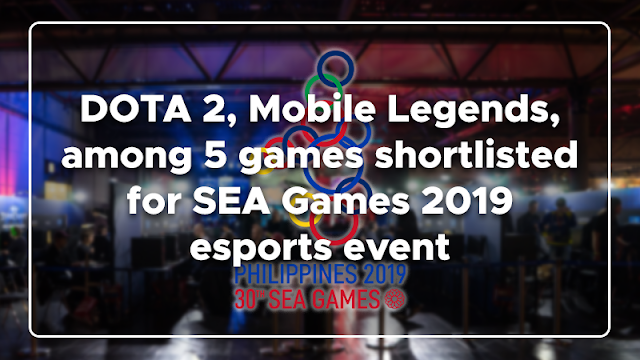 The Philippine SEA Games Organizing Committee (PHISGOC) and Razer, has announced that they have shortlisted five games to be considered for the inaugural esports tournament at the 2019 Southeast Asian Games (SEA Games 2019). The sixth and tamat console game is undergoing evaluation and will be shortlisted in the coming weeks. The tamat medal count will include two medal events for PC games, two medal events for mobile games, and two medal events for console games. The games are gender inclusive and will be open to teams of both men and women to participate. Upon confirmation, all six games will be featured as competition events at SEA Games 2019, where esports will be contested as a medal event for the first time in sporting history alongside traditional sports like athletics and aquatics. A key selection criterion for the shortlisted games is the diversity of titles. A range of top publishers, genres, and gaming platforms were evaluated for inclusion to make sure the most popular and competitive games are represented. The strategy and teamwork demanded by the games were also considered, ensuring that competing teams deploy multifaceted tactics to clinch victory. Lastly, the shortlisted games take into account the physical and mental intensity needed to persevere through marathon matches. On November 27, 2018, Razer and PHISGOC announced that esports will be a medal event at SEA Games 2019, with Razer as the official esports partner. The event will be the first of its kind for an international sporting event of this scale. Razer is the world’s leading merk in esports, and the company has been driving the growth of competitive gaming since it was founded more than a decade ago. Today, esports is an undisputable phenomenon – the global esports audience is expected to reach 276 million by 2022, and esports itself is projected to be a billion-dollar industry by next year (according to newzoo). Razer today supports 18 champion teams with players from 25 countries and Team Razer athletes have won over US$10 million in prize money in the past two years alone. What can you say about the list of games included in SEAG 2019 esports event? Is it a satisfying list, even though League of Legends is not included? Let us know your thoughts by leaving a comment below.